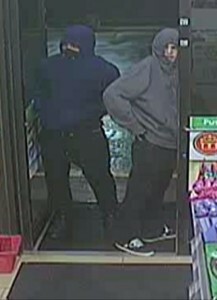 Killeen Police investigate early morning 7-11 Convenience Store Robbery. Officers responded to the 7-11 Convenience Store located at 1814 N. W. S. Young, on Wednesday, March 30, 2016, at 3:46am, after receiving a 911 call advising the store had just been robbed. Upon the officer’s arrival they were told three males entered the store and one male jumped the counter and demanded money, the suspects then fled the area on foot. One suspect was armed. No one was injured during this incident. Detectives are asking anyone who can identify the suspects in the attached video or photos to please contact Crime Stoppers at 254-526-TIPS (8477) or go online at www.bellcountycrimestoppers.com. You can now download the P3tips app on your smart phone. All information is anonymous and confidential and if your tip leads to the arrest of the suspect, you could be eligible for a reward up to $1,000 in cash.